I've been enjoying puppodums at Indian restaurants for a long time but I never knew exactly how many calories they had, or if I could enjoy them at home. 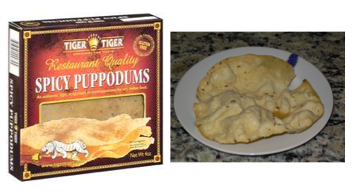 In case you've never had one, a puppodum is a delicious thin, crispy, puffy, and sometimes spicy cracker often served as an appetizer before an Indian meal (I took a picture of one to the left so you could see what one looks like cooked). I found some yummy looking puppodums at Whole Foods a few weeks ago that are made by a company called Tiger Tiger. I was thrilled to see that 2 packaged puppodums were only 47 calories, 0 grams of fat, and 3 grams of fiber (so 0 weight watchers points!). I decided to buy them to see how they would taste cooked without oil (sadly if you eat them at a restaurant you'll have to factor in additional calories for oil). After experimenting around cooking them in a pan with just a little bit of Pam spray (which turned out delicious), I realized that I could cook the puppodums oil-free in the microwave for 45 seconds and that they would still come out perfectly crispy, delicious, and still only 24 calories each! Definitely a new-found favorite snack for me! Huh ... puppodums?! Never heard of them, but they look great!! Thanks for the info! Have a good day! Wow. That's super low-cal. I've had puppodums at a restaurant, but I never realized that's what they're called. I'll have to check these out next time I'm at Whole Foods. good find! i will have to look for them next time. I love them, too. In fact, there's not much Indian food I don't love. I would have never guessed they could be cooked successfully in the microwave!! Good info! I've never seen these in my life. I'm fascinated. There are many different versions of puppodums you can get i.e. made with rice flour, lentils and even cassava / yam. Frying is the thing that most restaurants do, but at home we normally dry roast them on the gas directly (use tongs to turn ever second or so) or like you did in the microwave. They are a great snack to have. Try an Indian grocery to get the various different flavours and types of puppodums. This is sooo going on my shopping list! You can also "cook" them directly on the flame of your stove top (use kitchen tongs to hold them). I love these things, I did not know they were so WW friendly! Wow, I've never seen them! Definitely worth looking for!!!! i want to try these! they look great! where do i look at the grocery store to find these? Just wanted to let everyone know that I found these at Harris Teeter, a chain in the Carolinas. Sharwod's was the brand name, and they are delicious! I found the plain puppodums at Cost Plus World Market for $2.99 a box. they are a real fine for me since I am gluten free. I sprinkle a little tumeric or curry powder on the plain ones and microwave. yumm.